Solar system games are a great way to get children interested in astronomy and science. Children usually enjoy learning about space, distant planets and the solar system. Exploring the night sky and identifying planets and stars with a telescope can also be an exciting adventure. Learning about the solar system is not only about learning the names of the planets, but also how they look and where they are situated in relation to one another. Some planets are terrestrial planets (Mercury, Venus, Earth, Mars) while others are gas giants (Jupiter, Saturn, Uranus, Neptune). There are also small planets also known as “dwarf planets”, much smaller than Planet Earth (Pluto). A solar system game can lead children to wanting to learn more about the universe, other systems, the different galaxies and other exciting science subjects. It can also evoke many questions: what is gravity, what is a moon, what is an asteroid or a comet? 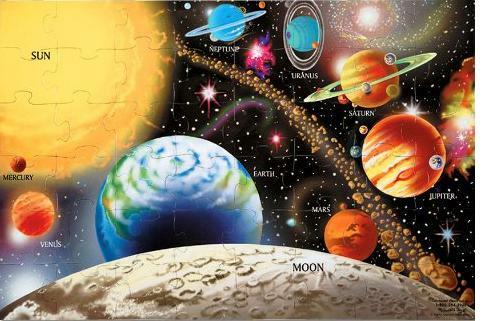 For younger children (ages 3 and up), we recommend the Melissa & Doug Solar System Puzzle. It is a relatively large puzzle (24” x 36”) comprising 48 pieces. The picture is colourful and includes all the planets, the sun and the moon and even the asteroid belt. It can be used as bedroom decoration once assembled (and glued together). The puzzle is a great way for kids to learn the names of the planets and discuss the solar system (for example, which planet is gaseous, which planets have rings, which is closest to the sun etc). The puzzle is very sturdy and durable, which is another reason why we recommend it. For school age children (ages 5 and up), we recommend the Planet Quest Game by Learning Resources. This solar system game for 2 to 4 players helps children learn interesting facts about the solar system. Kids earn cards for each correct answer about the planet each time they pass a planet or the sun. The board game includes a spinner and over a hundred question cards. It is another game that we like because children tend to enjoy it and because it has won an award. You should not hesitate to take your child to a planetarium or to get a home planetarium like the Uncle Milton Star Theatre Pro. Home planetariums project stars, planets and galaxies on the wall and ceiling. Don't hesitate also to watch a movie about space at an IMAX theater or to buy a documentary (DVD) or a book about the solar system.